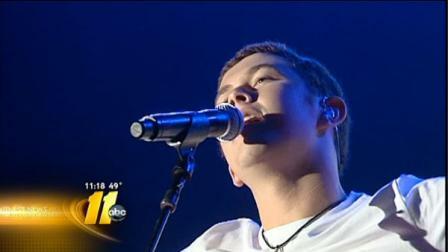 Scotty McCreery: ALL AGES SHOW! McCreery's first studio album, Clear As Day, debuted at No. 1 on the Billboard Top 200 and Top Country Albums charts, making him the youngest man in history to open at the top of the all-genre chart with a debut release. It also garnered the highest sales of any country solo album released last year, held the No. 1 spot on the Billboard Top Country Albums chart for six weeks and earned Platinum status in just thirteen weeks. Scotty won New Artist of the Year at both the 2011 American Country Awards and the 2012 Academy of Country Music Awards. He also won the USA Weekend Breakthrough Video of the Year for "The Trouble With Girls" at the 2012 CMT Music Awards. McCreery was ranked No. 1 on Billboard's list of Top New Country Artists for 2011 also earned the No. 4 spot on Billboard's 2012 List of the Top 21 Under 21. Scotty spent most of 2012 opening for Brad Paisley's Virtual Reality Tour 2012. McCreery recently released Christmas With Scotty McCreery, which debuted at No.1 on the Billboard Top Seasonal Albums chart and became one of the season’s top holiday albums. Scotty has continued to perform and record while pursuing an undergraduate degree at N.C. State University. You’d never know it from his unfailingly polite, unflappable demeanor, but the rise of young Scotty McCreery has been blindingly rapid. Following a youth spent singing in church in the Raleigh satellite community of Garner, N.C., he led a praise-and-worship group called Audience of One. More significantly, he sang with an advanced high-school chorale group called Die Meistersingers. It required him to sight-read music, perform classical pieces and compete with similar groups on a national level. RALEIGH -- Garner-native Scotty McCreery won't be living in the dorms at N.C. State this year, but it isn't because he's too big of a country music star. McCreery says "dorm life with the public bathrooms" wouldn't have gone over too well with him. Instead, McCreery is living in an apartment just off campus with three guys he's known since he was a toddler. McCreery is a sophomore. He will sing with the university's chancellor and head football coach this Saturday at the end of Welcome Week. CREDIT TO: DrDeb from Idol Forum for creating this list and keeping it updated!! NOTE: To reach the 'activator' stations, you will need to scroll through the monitored stations until you get to Post #2! Jeremy Robinson now steps in to be the host of Taste of Country Nights, heard Monday through Friday on Townsquare Media stations nationwide from 7 PM to midnight. It seems that Jeremy both takes requests and does a Countdown. Taste of Country Nights presents the 5 most-requested songs of the day. You decide which songs make the Top 5! To cast your vote, call (888) 678-9995. KAWO-FM (Boise, ID) -- They list ILYTB; we need to convince them to add SYT! THE NEW 93Q (Houston, TX) -- He's baaaaaaaaack again!